With vintage houses and buildings, the hardware and lighting are architectural “jewelry.” In any renovation or restoration, attention to detail is crucial to a successful outcome. And among the many details, matching the style of hardware to the period of the architecture is critical. Actually, any changes to a vintage or historic house or building need to be considered with regard to what is right for the period of the architecture and the individual building. With those foundations in mind, Victorian hardware and lighting in a Mid-Century Modern will obviously look odd and out of place. During the Mid-Century Modern Era, Victorian buildings were causing chagrin for their excessive ornament, and were often considered ugly. Most architectural styles go through an “ugly period” where they are rejected in favor of a newer and more exciting architectural style. So having some grasp of the cultural perspectives and architectural styles of the time can help guide decisions. From a broad-brush perspective, here are some guidelines broken into periods for considering hardware for historic architecture. Please remember that each period has a lot of depth, so this is just a broad perspective. For more information, I would suggest looking at the information listed in the links at the end of the article. The late Victorian period (1870s-1901) was a time of design exuberance. Detail was king, and much of the hardware and lighting of this period reflects this esthetic. The more utilitarian spaces, such as kitchens, bathrooms, or laundry rooms, would have been very simple. But in the formal areas that guests would have seen, the hardware and lighting fixtures were meant to impress. The Arts & Crafts Movement and Art Nouveau both rejected exuberant Victorian decoration for a simpler esthetic. The Arts & Crafts period (about 1890-1920s) reflected an orientation toward “hand crafted,” even though much of it was not actually made that way. Art Nouveau (1890s -1917) was running concurrently to the Arts & Crafts period. The Art Nouveau esthetic was one that featured a graceful organic fluidity. It came to a close with the beginning of the First World War. The 1920s ushered in a time of revivalist architecture, inspired by the return of the soldiers who had been in Europe during the war. Many of the buildings were interpretations of the Spanish/Mediterranean, English Cottage, French Villa, and Dutch Colonial styles. The hardware and lighting often reflected these revival styles being interpreted in the building. The 1930s brought the Great Depression, but also new architectural concepts that were emerging in Europe. Out of Germany the Bauhaus movement was starting to take off, bringing with it the bold, clean lines that emerged into the Art Deco style. This streamlined approach helped influence the foundation for Frank Lloyd Wright and the Modernists. The 1940s, was a period that was moving out of the Great Depression, but not quite into the Space Age that heralded in Sputnik. There was the influence of the Second World War, which also brought rationing and a sense of pride in conserving resources to help the war effort. The 1940s was a time of well-built but modest homes that held certain pre-Space Age innocence. The 1950s ushered in Sputnik and the space race. The Mid-Century Modern style shows the influence of the Cold War and speculations about space travel. 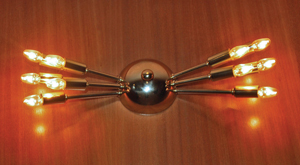 Again, our material culture began to reflect the events happening all around us and brought us such things as “Sputnik” light fixtures and star-burst front door escutcheons. When working with a vintage home, it is very important to keep in mind what was happening in the world when the house was built. Learn about that period. Educate yourself about what was right for the time. If you are thinking about buying a house, choose a house that you find attractive as it was originally designed. Ask yourself if you love the architecture and the period from which the house was built. Avoid trying to make a Victorian into a Mid-Century Modern, or a Craftsman Bungalow into a Contemporary house, etc. Love the quirk factor that vintage architecture offers. Mixing periods with regard to lighting and hardware usually happens when people don’t understand the period of the house, or they are attempting to make the house something it is not. It is always best to wait and find a home with architecture that you love from a period you connect with. The best way to avoid a major “remuddle” is to embrace the period of the home, rather than trying to force the house to be something it was never meant to be. Thank you for this insight. To be welcoming and embrace the real vintage of our home adds real meaning to choosing the palette of renovation options, and also helps us to find ways for our family to correspond with the past and present in our place called home.